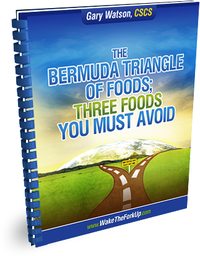 ﻿﻿ The Bermuda Triangle of Foods | Wake the Fork Up®! What would be the most damaging and addictive food out there? By far, I would have to say those processed foods (foods that come in a can, box, plastic bag, from a fast food restaurant, etc.) that contain the highest percentage of cautious carb sugars and toxic chemicals, such as trans fats and estrogenic producing chemicals.